This speedy Italian-style omelette is ready in less than 30 minutes and combines courgettes, mint and crumbly feta. Preheat the grill to a medium heat. In a large bowl, beat together the eggs and milk and season well. Stir in the courgettes, mint and half the feta. Heat the oil in a 20cm non-stick frying pan and pour in the egg mixture. Cook over a low heat for 8-10 minutes without stirring, or until the frittata begins to set. Sprinkle the remaining feta over and place the pan under the hot grill. 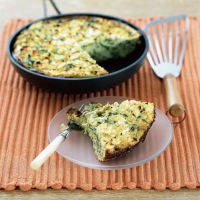 Cook for a further 2-3 minutes until the top is golden and the frittata is completely set. Allow to stand for 3-4 minutes before slicing into thick wedges. Serve with mixed salad leaves and whole baby vine tomatoes that have been drizzled with extra virgin olive oil and grilled until just starting to soften. For extra speed, grate the courgettes in a food processor. Try thinly slicing 2 chicken breasts and stir fry in the oil for 6-8 minutes, before adding the egg mixture. Try a fresh, grassy New Zealand Sauvignon such as Montana Sauvignon Blanc from Marlborough, which will go very well with the feta and the mint.